In a bizarre twist, Wargaming.net, the developer of the office's favourite MMO, World of Tanks, has announced that you'll soon be able to buy a boxed copy of the game at your favourite retailer. 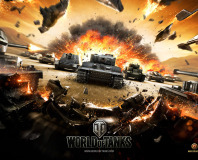 World of Tanks puts you in the commander's seat of over 200 different World War II tanks and self-propelled artillery, battling it out across the globe with over 5 million other players. As you play, you earn experience points and virtual credits that can be used to upgrade your vehicle with more powerful guns and engines, and eventually buy whole new vehicles. It's intensively addictive and, despite its detailed model, is incredibly easy to pick up and play. At its most basic, World of Tanks is free to play, but you can also buy gold tokens for real money that you can spend on a Premium Account, which doubles the amount of experience and credits you earn per battle. 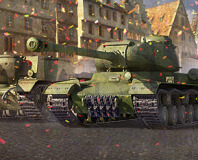 There are also several tanks and upgrades that can only be purchased with gold tokens. * Of course, tank buffs will know that this is actually a French Hotchkiss H39 that the Germans captured and converted for their own use. The boxed copy also includes an invitation code you can send to a friend who doesn't have an account yet, which includes a three day Premium Account and 1,000 gold tokens. Wargaming.net reckons the boxed copy of World of Tanks should set you back 9.99 Euros, but we've already seen it available for pre-order at Play for £5.99, well below the value of all the premium content if you bought them via the game's online billing system. Does it make sense to buy a hard copy of an MMO game? Are you already playing World of Tanks? Let us know your thoughts in the forum. Online tank deathmatch game World of Tanks reports that it now has 40 million registered users, with 500,000 concurrent players on its Russian servers.